Never judge a book by its cover? Well, OK. But: Never convict an author for his (or, of course, her) writing?! Pish-tosh! The Gram With a Thousand Rules: “I received some interesting books for Christmas this year. The one I am reading right now is not one of them. “It’s my own darn fault. “This atrocity had to have been written by a committee. An honest-to-gosh writer captured my interest for the first couple of chapters and then must have taken a break and called in an attendance taker and a statistician to fill in for a few chapters. “My mother raised me with the belief that you should never, ever start a book without finishing it. ‘You owe the author that much, dear’ was her admonishment, so to just give up and to heck with finding out who the murderer was seems sacrilegious. BULLETIN BOARD SAYS: No offense intended, but your mother could not have been more wrong. You don’t owe the author one blessed (or cursed) thing! Think of the excellent books you could have read in the time you spent slogging through books you didn’t care for. 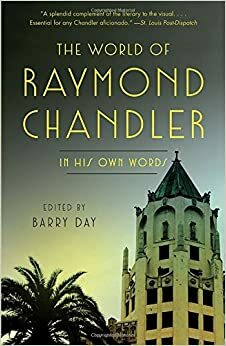 Semi-Legend: “I’ve been on a Raymond Chandler kick, having just devoured ‘The World of Raymond Chandler: In His Own Words,’ by Barry Day (Editor). “Today, thanks to MinnPost, I was clued to ‘Finding Marlowe,’ in The Los Angeles Times. A Lady Who Loves Little People: “This year, I was lucky enough to be scheduled for Reading Friends on my birthday. My time with the children is always a treat that I look forward to. I brought two small Kit Kats with me, and put one on the table in front of my first reading friend, who is a third-grader. I told him it was my birthday, and that the Kit Kat would be his if he could guess my age. He looked me over very carefully, started to form the number 30, changed his mind and said I was 40. Perhaps my wide smile gave me away, because he then changed his answer to 45. I told him that was close enough, and he could have the candy. “My next reading friend is a fourth-grader. I made him the same offer. His first guess was in the 40s; however, he self-corrected right away because he remembered that his mom is 38, and he knew that she was once a student of mine. I reminded him that his Uncle Chris was a former student of mine, too, and he is older than his mom. With that, he took out a piece of paper, grabbed a pencil and began his calculations. He recited out loud how old students are in fourth, fifth, sixth and seventh grades (seventh grade is the grade his mom and uncle were in when I taught them). Demonstrating his brain power, he asked me for the year I was born. I told him that since I was in front of him, he needed to guess my age by looking at me and considering the facts that he knows. He spent several minutes writing figures on his paper, and then he handed me a note that said: ‘Somewhere in your 60s.’ I praised him for his excellent reasoning skills and gave him his candy. BULLETIN BOARD SAYS: Happy birthday, ma’am. Enjoy what’s left of your seventh decade! John in Highland: “Recent Nixon humor brings back memories of 1972, when the “trickster” was running for re-election against George McGovern. I remember that I had this book-marker in one of my textbooks. “Few of us college students were conservative-minded, and the school Young Republicans group had few members. Another close encounter of the natural kind, reported by Papa Whiskey: “Had an encounter with the flock of wild turkeys that live on the Mississippi River bluff next to the University of Minnesota campus. I brought some pieces of old bread, which brought them right up to me. These shots show their handsome plumage and stern expressions. Thursday’s Bulletin Board included this note from Fudge Brownie: “Subject: When I grow up. “I have no memory of being a kid and wanting to be something specific when I grew up, but when I was in high school, I did think long and hard about it. “When I was a senior, I wanted to be an airline stewardess, but you had to be 21 to do that. So my bright idea was to be a nurse until I was 21. I remember telling people that . . . and looking back now, I’m sure they were thinking that I was one clueless kid. “I’m all grown up now, and I feel like one clueless adult. We presently heard from Sugar Babe: “Sugar Babe can’t be the only one who thinks that Fudge Brownie was not clueless for planning on being a nurse until she was old enough to be a stewardess, but instead was creative, pragmatic and ambitious. “Fudge Brownie finishes with the throwaway line that she ended up joining the Air Force, and that leaves us eager to hear more: What drove that decision? What was basic training like? Where were you stationed? What parts of the world have you seen? What’s your worst memory? What’s your best memory? Elvis: “Elvis got too excited eating his banana peanut butter sandwich yesterday and bit down hard on his tongue. Soon the sandwich was turning pink, and he was tasting blood. Being a typical guy, he just ignored it, but 30 minutes later it was still bleeding. Direct pressure with a tissue stopped it after a few minutes. “Elvis turned to the internet to see if there were any other things he should do. WebMD had a good article, albeit with two lowest-common-denominator items in their list of treatment recommendations. here’s Mary: “Subject: The circus marker. BULLETIN BOARD SAYS: Yes . . . and you can read that other side here. Bloomington Bird Lady: “When my daughter’s friend died in a terrible car crash, he left his cat. I don’t know what he had named it, but she then decided to adopt his cat, or it would have been . . . well, you know . . . at the animal shelter. She named the cat ‘Orphan Annie’ and brought her home to join the two older cats, who were very ‘set in their ways.’ Chaos. There was hissing and much one-upmanship amongst the group. The older cats had their special sleeping places, their own litter box, so being compatible wasn’t on the horizon. ‘Bunny’ and ‘Baby’ put their foot (paw?) down and refused to get along with Annie. “When we’d talk on the phone, I could hear turmoil in the background, as cats get jealous of their owners’ being on the phone, and I would have made the situation worse just by asking how it was going. One cat died this past year. No, not Orphan Annie; that might have helped. No . . . the situation was almost the same. Naughtiness everywhere. “Something to be learned from everything we do, perhaps. If you have two females of any species, do not bring another one into the house. It’s like being best friends back in elementary school. If a third person wants to be a best friend, too, watch out. “Music making is just the opposite. If you have two flutes or two violins playing together and trying to be perfectly in tune, it’s much easier if there are three. Maybe it’s the soundwaves? Someone may know the answer.